This small book of WWII photographs does not attempt to show the history of Japan's kamikaze attacks against the US Navy in any organized fashion. This self-published book does not mention the author, but a Lulu Publishing web page that advertises the book gives the author's name as Gary Mortensen. Another page on the same website explains that National Combat History Archive, the publisher of this photo book, is "a foundation dedicated to the aggregation, preservation and dissemination of military combat and military related film, photographs and personal memoirs." Based on the low quality of Divine Wind, the National Combat History Archive seems more like a scam to make money by publishing easily obtainable photos in the public domain with minimal research effort to put them together into a coherent history. The contents focus on the ohka rocket-powered glider bomb with about a third of the photos dealing with this kamikaze aircraft, even though the Japanese Navy and Army employed many other types of aircraft in suicide attacks. Some photos in the book have little or no relationship to kamikaze operations, but rather they just show some general aspect of the Pacific War such as a Japanese destroyer or American ground forces on Okinawa. The captions to the book's photos are brief and often vague. 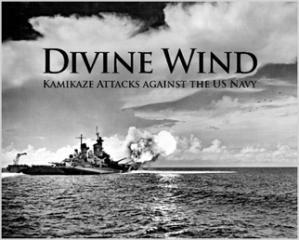 The captions contain some huge mistakes for a book that purports to tell the story through photos of Japan's kamikaze attacks against the US Navy. For example, the photo showing the aircraft carrier USS Bunker Hill (CV-17) smoking after hits by two kamikaze aircraft has a caption that the attack took place in April 1945 rather than on the actual date of May 11, 1945. In another example, the famous photo of a Zero fighter about to crash into the side of the battleship USS Missouri (BB-63) on April 11, 1945, has the erroneous caption identifying the ship as the USS Wisconsin. Another caption makes the ridiculous statement that "once successfully inside the perimeter defenses of the naval screen, Kamikazes were virtually unstoppable." In reality, after passing perimeter defenses, many kamikaze aircraft crashed into the sea when hit by American warship anti-aircraft guns or by CAP (Combat Air Patrol) fighter guns.